Godrej & Boyce’s Office Equipment Division achieved a 4-fold increase in contribution after adopting the Anaar Roadmap. The barriers that existed between departments were broken down. Internal customer satisfaction, process-oriented thinking and teamwork replaced department-centric thinking, fire-fighting and finger-pointing. A win – win atmosphere was created. External customer satisfaction increased, and along with it, sales, and the bottom-line. The Office Equipment Division of Godrej and Boyce Manufacturing Company make standard and custom office equipment. The company is a well established enterprise founded over a hundred years ago and has an excellent reputation for quality and brand recognition. The annual sales of the business unit are around US$220 million. measured by orders booked, were higher than X %; goods produced, as measured by the sales value of production, was greater than Y %; more than Z new products were released for production. All the managers were looking forward to a hefty bonus. However, they were shocked to learn from the finance manager that there were no profits to distribute by way of bonuses; the stores manager reported that the warehouse was overflowing with products waiting to be dispatched; regional sales managers reported that customers had to wait longer to get their orders filled and that only one new product was introduced into the market. How could this happen? All the employees worked very hard throughout the year and exceeded their objectives! The answer lies in the fact that every department focused on meeting their own objectives. The sales people focused on increasing the orders booked – they booked a large number of custom orders, orders that require extra treatment in the plant (totally valid and approved customization; no rules were broken); production managers focused on maximizing production through large batch sizes and fewer product changeovers on the production line; planning meetings witnessed a higher level of conflict between sales and production people. The plant was jam packed with finished goods, which adversely affected working capital turns and increased the cost of carrying the finished goods. Design engineers developed new products they were most excited about, not necessarily the ones for which there was a market. Everyone worked very hard indeed! The Anaar Roadmap was introduced at the Office Equipment Division. After going through training on Anaar’s philosophy and methodologies, the management team recognized that the primary causes for their business challenges were due to a lack of teamwork, a rigid departmentalization of the workforce, and a highly bureaucratic decision-making process. Anaar’s guiding principles were adopted; several improvement projects were initiated; several problems that existed for years were solved by following the 7-stage Anaar Continuous Improvement Process. After P. D. Lam was appointed as president of the business unit, the Anaar Strategy Integration Process (ASIP) was utilized to develop next year’s Annual Business Plan (ABP). The team-based and process-focused ASIP approach helped break down barriers that existed between departments and created teamwork at the highest levels of the organization. All department managers were told that the bonuses for all would be determined by how well the entire business unit performs on the above goals. At every opportunity, Lam stressed the importance of defining and improving processes in all aspects of the business. He demanded and encouraged cross-functional teamwork. During the year, the nature of interaction between departments changed dramatically – the once prevalent climate of protecting one’s turf changed into an environment focused on better satisfying customers, external as well as internal. The sales teams focused first on generating orders that required less customization; design engineers focused on external customers’ needs and manufacturing ease; production planning teams developed production plans with a focus on faster dispatches to customers. The efforts of all the departments were aligned to business goals, and not departmental targets. For example, the production manager would call the sales manager every morning to ask what new orders have been received and as to what changes he needed to make, to their once sacrosanct production plans, in order to quickly fill the orders and invoice customers. They changed the colors on their paint lines twice a day compared to the earlier practice of changing once in two weeks, even though it adversely impacted the paint shop manager’s budget! The constancy of purpose and leadership demonstrated by Lam and his management team, and the implementation of the Anaar methodologies, resulted in sustaining the transformation of work culture. Internal customer focus was much strengthened and numerous internal processes got streamlined. Cross-functional teamwork became a way of life. Conflicts between departments decreased and working environment improved, creating a true win-win atmosphere. External customer satisfaction increased and along with that sales, and the bottom-line. As a result of such actions, customers’ orders were filled faster – on-time delivery increased from about 40% to around 80%; the warehouses got emptied of finished goods stock thus creating extra space – as someone commented “we have created a few football fields within our premises!” Over a period of time, the process engineers developed innovative ways to reduce the amount of time and paint lost during changeovers. Working capital turns increased and finance costs decreased by about 50%. The profitability of the unit was significantly higher than before. 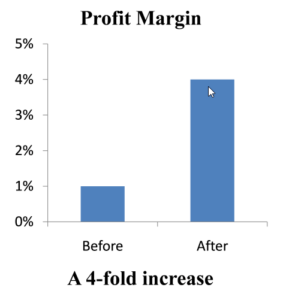 The contribution, measured as a percentage of sales, increased from around 1% to over 4% (a 4-fold improvement). In subsequent years, the profitability was not only sustained at these improved levels, but increased to even higher levels! Based on the results achieved at the Office Equipment Division, the Anaar Roadmap approach was introduced, over a period of time, at all the other 12 business units of Godrej & Boyce Manufacturing.